Happy Trails KLR650 Skid Plate Impact Isolator Kit, This is the insurance policy that assures you the skid plate will do its job. A quality skid plate is a must-have item for serious off-road riding. Our Happy Trails skid plate for the KLR650 improves on a basic proven skid plate design we have been offering for over a decade. One of those long-standing features has been to incorporate noise reduction technology to reduce reflected noise to the rider. But even more important is this kit's design to promote a soft mount and impact dissipation rather than transferring all energy to the mounts. Background: Years ago we found with the KLR650 skid plate that we could go from 3/16 inchť to 3/8 inchť aluminum bottoms but direct impacts on the skid plates could bend them and potentially crack the case. The better solution was using rubber matting on the floor of the skid plate and having preload with the bottom of the case. With this approach the impact would cushion and disperse the point of impact so the skid plate does not dent, bend or flex causing destruction of the case. 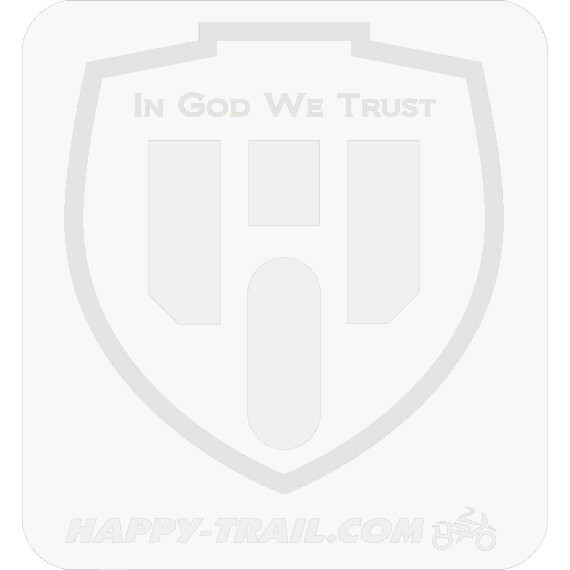 This has been an in-shop service we haveve provided for years for local customers at Happy Trails and on our own personal bikes. Dimensions: Large rubber 8 inches long, 4 inches wide, . Install note: The pad "squishes" up against the case and the installer needs to fully understand the concept. If it is tight it can't compress. The nut needs a locking method so the bolts will not back out. The nut is welded on and the resistance method must be beat resistant. The DIY'er thinks something is wrong and stops twisting when there appears to be excessive torque needed. The contact between the impact rubber, skid plate and the frame insures that when the skid plate impacts an object the cushion effect happens and the skid plate does not deform and penetrate the case.